This past Tuesday, April 2, was the big day: the official publication of my new book, Crosby, Stills, Nash & Young: The Wild, Definitive Saga of Rock’s Greatest Supergroup. At times I feel like my entire life has been leading up to this day, from the time I borrowed my older sister Colette’s copies of Crosby, Stills & Nash and Déjà vu to the years in high school and college when I followed their saga in the pages of Rolling Stone and other rock mags. Well, now I work at Rolling Stone and have interviewed CSN for the magazine and my book Fire and Rain. And now, about three years after I began and after interviewing about 100 people for it, I’ve told their complete story in my book. 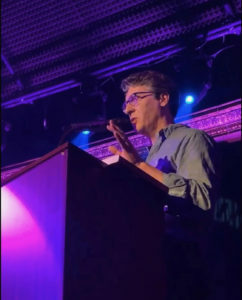 The festivities actually began on Sunday, March 31, with a launch party for the book at the Cutting Room here in New York. Many friends and colleagues were kind enough to stop by, and musicians Sean Richey and James Sheppard joined me for a words-and-music event. They played a handful of CSNY classics while I yapped in between about the song and group history. Sean and James were terrific, and their version of “Déjà vu,” not an easy song to learn, nailed it. That’s me at the podium; more pictures will follow. Launch day began with an appearance on SiriusXM’s morning show, “Feedback,” on the Volume channel with co-hosts Lori Majewski and Nik Carter, both of whom offered up their usual energy and smart questions. 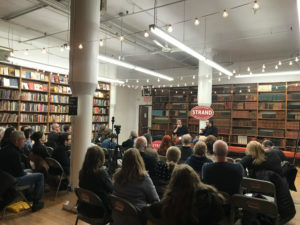 Then came a few radio interviews, a talk with a writer for Closer magazine (to be published soon), and, then, that same night, a joint appearance at the legendary Strand Books in New York’s Greenwich Village. I was joined by my Rolling Stone colleague Brian Hiatt, author of the also just-published and must-read Bruce Springsteen: The Stories Behind the Songs. (That’s us with the crowd.) The room was full, the vibe was great, and we talked about our respective book subjects and signed a ton of books. Brian and I will also be taping an episode of Rolling Stone’s Music Now podcast—will fill you in later on when that airs. I’m exhausted—but in a good way. March 11. On that day in 1969, Stephen Stills shooed away David Crosby and Graham Nash so that he could figure out a new arrangement for Crosby’s song “Long Time Gone.” The trio were in the midst of cutting their first album as a trio, but that song was proving to be elusive. When Crosby and Nash returned to the studio many hours later, Stills, with the help of drummer Dallas Taylor, had finally figured it out, with a menacing throb of an arrangement on which his electric guitar sounded like a growling dog and his organ conjured an ambulance siren. And with that, Crosby, Stills & Nash was pretty much done and ready for its place in history. On that same day, but a year later, in 1970, CSNY’s landmark Déjà vu album was released. On March 12, 1968, Joni Mitchell, at the dawn of her career, began a multi- night stand at Le Hibou, a folk club in Ottawa, Canada. Four nights later, on March 15, the British pop group the Hollies arrived in town, and after their show that night, Michell attended a party for them and met her future lover, Graham Nash. It would be many more months before the two coupled up, resulting in his songs like “Our House” and hers like “Willy,” but the seeds of that relationship arrived that March day, 1968. On March 14, 1973, Stills was married for the first time, to French singer-songwriter-pianist Veronique Sanson. On March 28, 1982, Crosby was on driving to a nuclear plant in San Onofre, California, where he was scheduled to join Stills and Nash at a protest concert. But en route, Crosby had a seizure, and his car veered from the right lane into concrete divider. He was charged with carrying a concealed weapon and driving under the influence of drugs or alcohol—the first of several arrests that would almost derail Crosby, Stills & Nash as well as Crosby’s own life. An eventful month, for better or worse! On April 2 itself, you can hear me talking about the book on SiriusXM’s music morning show, “Feedback, “on the Volume Channel, at approximately 8 a.m. (I’ll update that time soon.) And that same evening, I will be appearing at the Strand bookstore in New York City to talk about the book and the craft of classic-rock biography with my Rolling Stone colleague Brian Hiatt, whose new book, the incredibly well-researched and illuminating Bruce Springsteen: The Stories Behind the Songs, hits shelves on March 27. Brian and I are planning a few other events at other locations, so keep checking back here for updates.